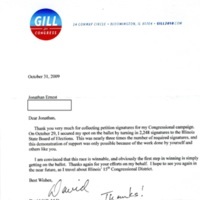 Democrat David Gill thanks his helpers (among which our contributor) for collecting signatures for his 2010 Illinois Congressional campaign. 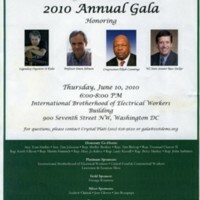 The gala took place on June 10th 2010 in Washington D.C. It honored Si Kahn ("Legendary Organizer"), Professor Simon Johnson, Congressman Elija Cummings and and WI State Senator Russ Decker. 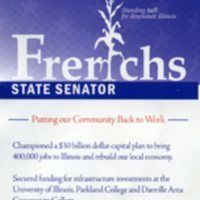 A petition to nominate Mike Frerichs to be voted for the Democratic Candidate for the office of State Senator in the 52nd District of Illinois. 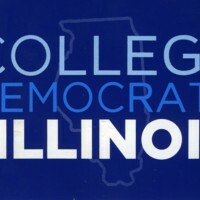 Bumper Sticker: "College Democrats of Illinois"
A blue bumper sticker advertising the College Democrats of Illinois. 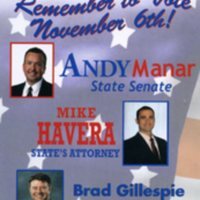 The Flyer was distributed during Andy Manar's successful campaign for Illinois State Senator (48th district) against the Republican candidate Mike McElroy. 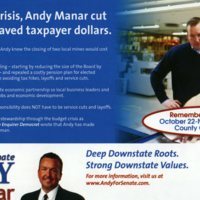 Manar won by 9,000 votes. 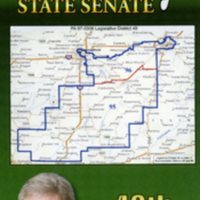 A Flyer for Mike McElroy (Republican) as State Senator (48th district) in the 2012 elections. 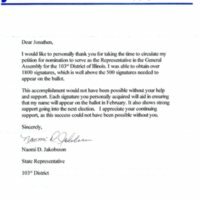 He lost the election against the Democrat Andy Manar by a margin of 9'000 votes. 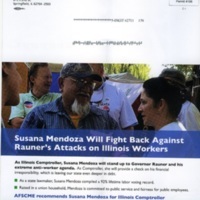 Susana Mendoza, a Democrat, runs for Illinois Comptroller in 2016 to challenge Leslie Hunger (Republican). 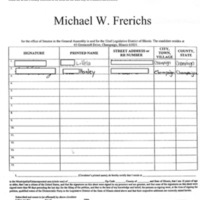 As of the publication on the UIS History Harvest website, the outcome of the election is yet to be determined.